How a dramatic boat rescue 30 years ago led to a career on the Nahanni. Canoeing through the canyons on the Nahanni River. Screams for help lead me to the shore of the Liard River where a haunting spectre appeared through the early mist of a cool September morning. A man, woman, and child were standing in a broken down aluminum boat, looking hypothermic from drifting downriver in the night. Laying across the bow of the boat was a refrigerator. At the time, I had no idea how this moment would shape my life and major events. Apparently they had run out of gas on the upriver journey to their village of Nahanni Butte where the Nahanni River meets the Liard. With no paddles or life jackets they were headed for certain death in the Beaver Dam Rapids downstream and they knew this camp was the last place they could summon help. I grabbed a canoe with another paddler who happened to be camped there, and raced out to the drifting boat. Towing the disabled craft with a rope, we struggled for two miles before finally reaching the safety of shore. I learned that the family had been heading home to Nahanni Butte with supplies, including the new refrigerator, when they ran out of fuel. The man had even jumped in the water during the night to try in vain to swim the boat to shore. They were extremely cold but overjoyed to be saved from the rapids below. “What can we do to thank you?” they asked. Wishing them a safer journey on their next attempt I assured them that their recovery was reward enough for me. After looking after them and ensuring they were in good shape, I slipped away, still unaware that the events of the morning were a turning point in my life. Back at home I had been applying to the government for a license to guide river trips on the famous Nahanni River. I had a fledgling outfitting company and I was drawn to the legends and beauty of the Nahanni’s canyons. What I lacked was the permission of the local First Nations people, which was mandatory for licensing. The villagers were understandably guarded about granting such a privilege to an outsider. They hadn’t responded to my letters. It was now the middle of winter. I had all but given up on my Nahanni dream, until I remembered my new friends in the village. I decided to give them a call. You need to understand that the Village of Nahanni Butte, population 95, is isolated and remote, with no road access except for an ice road for a few winter weeks. In those days there was only one radio telephone in the community. To reach someone you had to hope that a) the phone was working, b) someone answered, c) they were willing to go get the person you wanted to speak to and d) that person was willing to come and talk to you. I lucked out on all four and in 10 minutes was speaking with the fellow from the river. “What you’re doing (corresponding by mail) will never work” he said. “Your only chance will be if you come and meet the people face to face”. “I can take you around the community and introduce you – but you have to come here – even then there are no guarantees”. So I spent my last nickel and flew with friends to Nahanni Butte. My friend from the river was true to his word and took me around to the cabins, introducing and putting in a good word for me. I left with a letter of permission. As they say, the rest was history. I never looked back, and have enjoyed over 30 golden years guiding on the river with the beautiful name. In that time I have enjoyed a great relationship with the people of Nahanni Butte. In the last decade I had a chance to give back. 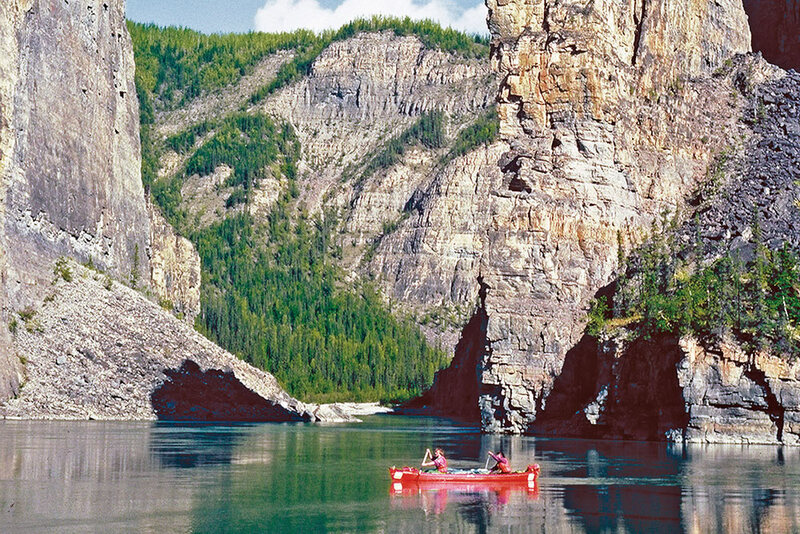 They wished to protect the entire Nahanni watershed (until then the Park only encompassed 1/7th of the watershed). I called on the thousands of past guests who loved the river, who in turn lobbied and created the political will to expand the park. By accompanying a cross country tour with the Deh Cho Grand Chief, with the political strength of the First Nations, and lobbying of the Canadian Parks and Wilderness Society, we were able to create the third largest Park in the world. Who could have known that such results could have come from that rescue on a misty September morning, refrigerator and all? 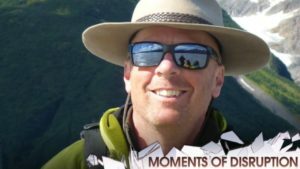 Neil Hartling is the founder of Nahanni River Adventures and Cana­dian River Expeditions, an author and Fellow of the Royal Canadian Geographical Society. Sometimes there is a turning-point in life that changes everything in an instant. 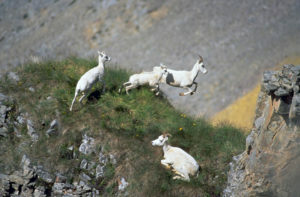 Neil Hartling tells the story of one of his most memorable wildlife sightings. 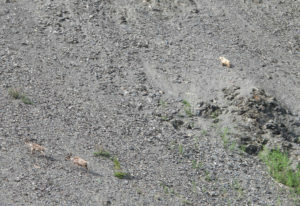 The story of two incredible wildlife sightings on the Firth and Nahanni Rivers.